​How can you tell if a tree needs to be removed? ​Tree Removal, 3 methods to price a tree. ​ ​Tree Removal- means the removal of a dead, dying, diseased, infected, infested, hazardous, or unwanted tree. ​​​​When is it time for that tree(s) to be removed? ​If you dont know here are a couple ways to check. ​1.) Twig test- grab a twig and break it, look inside and see if there is any sign of life. Is it green underneath the skin of the twig? If so that branch is ok. If it is not green then its dead. Check the rest of the tree and if there is more than 40% dead, then its time to remove the tree. ​2.) 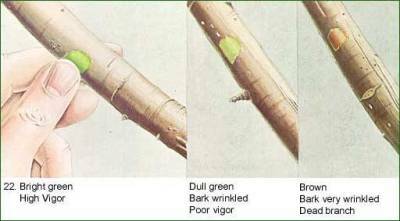 Visual Inspection- Walk around the tree and look for bad signs, such as bark peeling away, cracks in branches, holes in the trunk or in branches, or decaying spots. 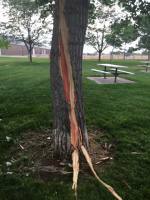 Is the tree infested with insects, has lightning hit the tree, are the branches alive or dead? Are you constantly picking up dead braches? Is it in a bad location? Maybe the tree was planted in the wrong location, to close to the house and it may even be growing into your sewer lines. Are branches growing over the house, or into the power and cable lines? If you are having any of these problems, then its time to have the tree removed. ​​3. After trying the first two steps, if you are still unsure about the health of your tree or are ready to get it removed, have one of our S&S service professionals come out to inspect the tree. Remember all Estimates are FREE. Dont wait any longer call NOW! ​Starting with the cheapest method and ending with the most expensive. ​Leave Lay- ​we cut the tree to the ground and leave it as is, where it is. Meaning you have to cut it up and clean all brush and debris yourself and hual it away. Thats the cheapest method. ​​​​Keep Firewood- ​we cut the tree down and remove all brush and debris. Then we cut up the remaining wood into firewood lengths and stack it i​​nto a nice neat pile. Most popular method. Complete Removal-​ we cut the tree to the ground and remove all brush, debris, and basewood. Clean the work area and hual off all of the tree. No hassel method. Easy or hard to get to. How far do we have to move the tree. Over the house, over the power lines, over the fence, over the flower beds, ect. How long the job takes.